Four hundred years of tradition in caring for large animals on ranches are behind the competition known as Charreada. Handed down from generation to generation, this precursor of the American Rodeo, is performed in a lienzo (arena), which is shaped like a key hole. Each competitor is dressed in the traditional suit (traje) of the charro. On his head, is the wide brim sombrero, which to protects him from the sun and acts as a helmet. The brim, also serves a shock absorber, to shield the head and neck if the charro is thrown to the ground. The body fitting suit is more then vanity. It’s made that way, to insure there is no flapping cloth to be caught by the horns of steers. His chaps are the same. The botinas, or little boots he rides with, protect his feet from the stirrups. On his botinas, he has his spurs. The saddle of the charro, has a wide horn. This helps safeguard the charro from being pitched off and from being hung up as sometimes happens on a western saddle, when the horn pushes into the diaphragm and then is caught by the rib cage. There are two grips at the back of the saddle, in case the charro needs to hold on because of a pitch or some other unexpected act of his horse. All in all, it is a very practical and safe way to ride. The charreada begins with the sound of Marcha Zacatecas. This symbolizes the charro’s history as the miniate-man of Mexico. Charros were more then vaqueros, they were an integral part of the military, fighting in all the wars of Mexico. A description of the army of Villa by an American reporter, speaks of the soldiers who were clad in the "short charro jacket"
The desfila, or parade accompanying the march, consist of the teams of competitors. This is a major distinction between the charreada and the American Rodeo. In the rodeo, the competitors compete between each other. In the charreada, in keeping with the Hispanic idea of sociality, the competition is between teams. Historically these teams were centered around the hacienda. Now, the teams are most often, centered around families. After the teams enter, the Marcha Dragona is played. At this time, the flag of Mexico or in the United States, the flags of both countries are presented. The honor guard consist of Charro caring ceremonial machetes. The national anthem is played and the flags retire. There are of nine suertes (events) in Charreada. 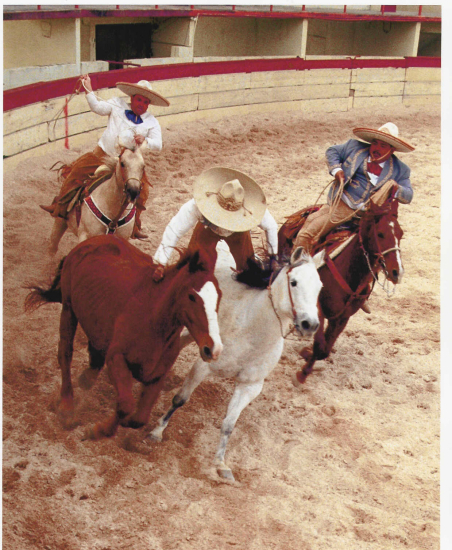 In the first, Cala de Caballo; (Horse reining) a charro gallops his horse the length of the lienzo, and slides to a stop. He then rapidly pivots the horse on each hind leg; for a minimum of three revolutions in both directions. Then he does two half turns, after which the Charro backs the horse down the lienzo. This was what a seller did to show a prospective buyer, how well his horse was trained. Piales is one of the most controversial of the events. In it, you rope the hind legs of a running horse and bring it to a stop. Doing this has about the same effect as a shoe string tackle in football and causes less injury to the animal then throwing a rope around its neck. To compete in Colas en Lienzo; (Bull Tailing) you must grab the tail of a running bull, wrap it around your leg, and pull it to the ground. This event developed, when charros determined that it was easier to move a steer by grabbing its tail and directing it to where you wanted to bring it down. This causes less trauma on the animal, then roping it and dragging it by the neck. One of the most exciting and colorful events of the Charreada is the Escaramuza, the girls side saddle team. The origin of this event is somewhat clouded. The romantic story holds that the women of the revolution would ride their horses to raise dust to distract the enemy, while the men attacked from the rear. The less romantic story says that a charro saw the flag ceremony in the Houston rodeo and brought it bach to Mexico and started the Mexican Carousal. During their performance, the girls of the Escaramuza dressed in the traditional ranchera dress, race around the arena, barely missing each other as they crisscross making energetic patterns. The rules for Jineteo de Torros (bull ridding) are quite simple. You ride until the bull stops bucking, or you fall off. After the bull has been ridden, the next event is Terna, or team roping. This event most readily distinguishes the difference between the American Rodeo and the Charreada, In the American Rodeo, the idea is to get the steer caught quickly and efficiently. In Charreada the emphasis is on style. The header must twirl his rope around his horse at least three times and spring it over his head before he catches the head of the bull. He then makes a bosal (halter) by flipping his wrist and sending a loop down the rope to catch the bull’s muzzle, to minimize the trauma on the animal. The second roper, twirls his rope around his horse just like the first or throws it like a yo yo, and catches the back legs and then the animal is dropped. Jineteo de Yegua or bare back riding has the same rules as bull riding. Just stay on. This is followed by Mangana, which is done on horse and on foot. (a caballo or a pie) In the first, the roper on horseback twirls his rope around his horse, springing it over his head at least once, while a wild horse is chased around the arena. As the horse passes, the rider, must catch the front legs. In the second, the roper, while standing on the ground, twirls the rope around himself, jumping through and back through the loop as a wild horse is chased around the arena. When the horse is next to him, he catches the front legs. Paso de Muerte (Pass of death) is the final event. In it, a rider jumps from his galloping horse onto the back of a galloping wild horse and rides until it stops bucking. Charreada is sometime called the national sport of Mexico, but it is more then that, it is a Tradition. This is because the relationship between men and horses is an integral part of the Mexican psyche, as exhibited in their language. A gentleman is Mexico is called a caballero or horseman. Even the brakes on vehicles are called frenos or the same name given to at a bit for a horse. Just look at the charro movies of Jorge Negrete, Pedro Infante, Antonio Aguilar, and Vicente Fernandez. They are the identical type of adventure that was made famous by Roy Rodgers and John Wayne. Each cinema exhibits the tradition of their respective country and in both cases it is a tradition worthy of preservation.